With deep roots in jazz, disco, funk, blues and salsa, Chicago bred artist Jeremy Sole has a versatile sound that’s undeniably contagious and good for the soul. From throwing loft parties at age 16, to opening for Ray Charles and now hosting a radio show on KCRW, this artist has a rich background full of peculiar accomplishments. Jeremy Sole’s musical mastery has earned him the respect of many and he has worked with icons like Lauryn Hill, Chaka Kan, Stevie Wonder and many more. 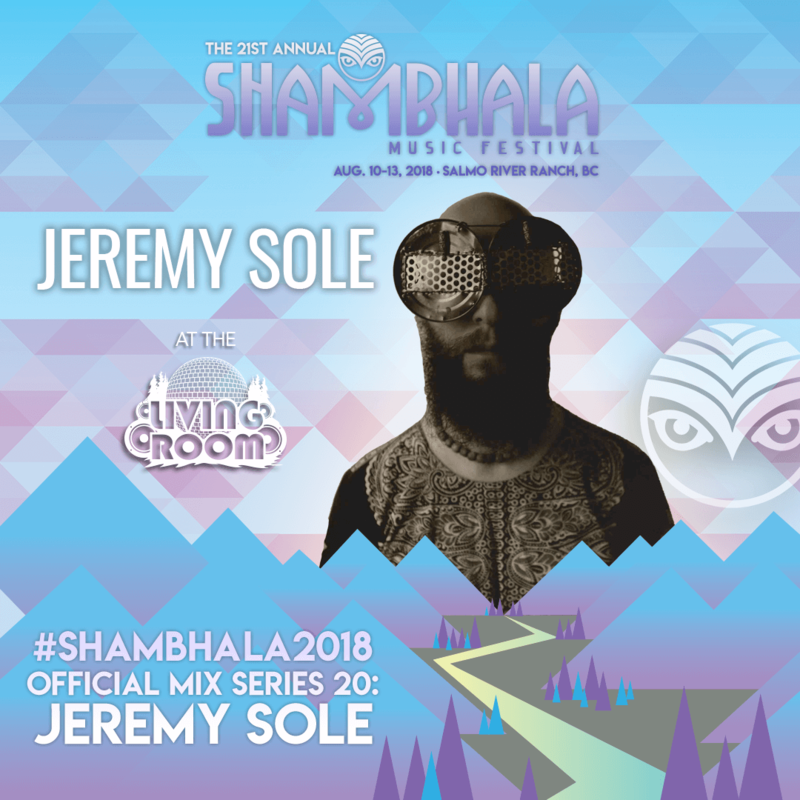 Before hitting the stage for the first time ever at Shambhala this year, Jeremy has whipped up an exclusive mix just for us. Be sure to catch his big midnight debut at The Living Room Stage Sunday and press play now to hear the delightful sounds of the one and only Jeremy Sole! What are you most excited for at Shambhala this year, both on the music front and the experience as a whole? I’m excited to hear some other performers and music that I never heard before. So many friends have played at Shambhala and told me how epic the vibes are there. What do you enjoy most about hosting a radio show on KCRW, and what are some of your favorite moments from the past eleven years? I’ve deejayed for about 20 years, and I’ve never pre-planned a dj set in my life. I believe it would be a disservice to the crowd and the moment we’re co-creating together. So I’m used to showing up and becoming a conduit for the energy in the event. But not until I started mixing on the radio did I realize how valuable an outlet it would be for me to have somewhere that I select music solely from within, having no input from a crowd. It helps me hear what I have to say to the world, or even to myself, through my song selections. Then when I show up to play for/with the people it’s a choir of different vibes expressing as one. As a selector on the radio, we know you have your finger on the pulse of the music world. Who are some of your favorite artists in any genre right now? My man Flako (aka Natureboy Flako) makes some gorgeous music, and his new album “Theme For A Dream” just came out. I just played with Gabriel Garzon-Montano, and he always blows me away. Kamasi Washington has a second album out, and is already the stuff of legend for the future of spiritual jazz. I could go on for days about folks… best to listen back to my weekly KCRW radio show to hear a lot more. You can listen via the free KCRW app or on KCRW.COM/JEREMYSOLE. Tell us a bit about the importance of sounds like funk and soul to your music and life? To me, the word soul as a genre of music, and soul as the eternal source within one’s temporary body, are both one in the same. If you take that nectar of life within us, and distill it down to a form of musical moonshine, that’s funk. Some really potent stuff too. What can we expect from your set at Shambhala this year? It’s not quite that I want to say to “Expect the unexpected”, more that I’d like to ask you to release expectations altogether. If we accept instead of expect, the world would grow into a lot more healthier and happier, and funkier place. © 2019 Copyright Shambhala Music Festival. Supported by Creative BC and the Province of British Columbia. Sign up to receive our Newsletter to go in the draw to win tickets to the 2019 Shambhala Music Festival. You’ll recieve news updates and exclusive offers, helping you to stay in the loop with everything happening at the festival. You can stop receiving our messages at any time. Your information is protected and never shared. Competition Terms and conditions apply.